Our signature award-winning roasting bacon is truly delicious. Cured on the bone, it has a distinctive unique flavour with a hint of smoky hickory undertones. This joint is ideal for carving and brings bacon to a whole new level. Particularly low in salt, with the bone bringing a certain sweetness to the meat. 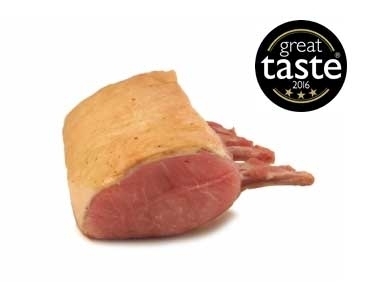 Having received a Great Taste 3 Star Award, here's what the judges had to say: "An impressive looking piece of bacon, with a good layer of fat, well caramelised. There is a good amount of juice when cut into, and it cut quite easily. The meat was succulent and soft, and there was a great piggy flavour and subtle smokiness. The flavours of the meat were superb and very well balanced through the curing. Clearly a quality piece of pork, and well looked after".